Very nice. Looks just like the one from GTA IV, nice job. I'm downloading this, nice mod Switch! needs to replace something else. im turning the knuckles into bling rings! maybe replacing the golf club? Cool! Switch is back, nice mod! Original mods, every time again. Nice work Switch Hope you'll be able to make these type of things for GTA IV PC (please, PC release). *starts up SAMI* (yeah, I'm too lazy to do it the manual way). Nice mod switch. I'll probably download it soon. @ Deji, i think he replaced the brass knuckles so it would look like he's actually holding it correctly. ye but i like most of the game exactly how it is. no 3d map mods or car mods. and it'd be annoying having it all the time. Yeah I posted it as the brassknuckles because I wanted a weapon that was close to a save for modding purposes and because it's something you can easily get at any time in the game. 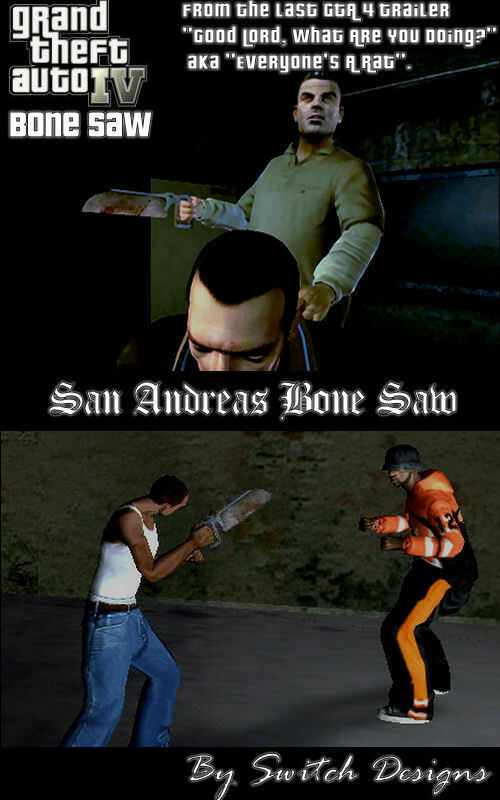 Plus because of the way he holds the brass knuckles it looked better as those instead of a different weapon and I wanted to be able to take a preview shot that showed how close the saw looks to the original in the GTA 4 preview. If memory serves me right if you want it to replace like the knife or another weapon with it instead just rename my dff and txd to the weapon name your replacing and it should work. I just just tested it with the knife by just changing the names of my txd and dff to knifecur instead of brassknuckles and it worked ok but didn't look as good when he uses it as it does when replacing the brass knuckles. Nice mod, don't got SA for PC. But nice to see it's still very much alive and people stay play.